My brother Mark, who loves to cook out, emailed me this photo early today to let me know how he was celebrating the holiday weekend. It’s hard to beat the taste of grilled lobster and corn. 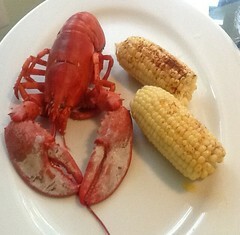 In my grilling days I always split the lobster and buttered the inside after sort of flattening it. This one looks like it was grilled whole, or maybe wrapped in some way, like in a lobster bake. On the other hand, while I used to think of dishes that just contained lobster as a waste of good lobster, I have been changing my mind about that. And my family did love the lobster newberg or thermador that was served at the Princeton Inn (now Forbes College) on Christmas Eve and other special occasions. So I recently made a point of trying the Lobster Mac and Cheese at Witherspoon Grill, and it was amazing. Look at that crusty puffy top! (Sorry ’bout the dark photo.) The sauce had overflowed duirng baking, and the baked on bits on the outside of the dish almost stole the show. But inside, oh my, such creamy goodness, infused with lobster taste, and plenty of pieces of lobster, in a creamy cheddar sauce and pasta that somehow still had some texture. For $19, this was a wonderful, decadent, meal that I am still thinking about. Longingly. By the way, Happy Birthday to Nassau Street Seafood this month (same ownership as Witherspoon Grill and Blue Point Grill) – 30 years and going strong!